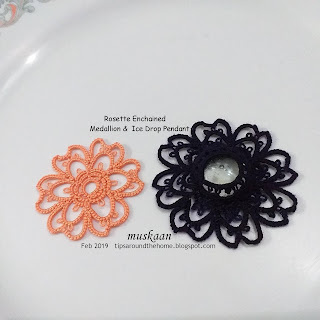 Ninetta’s Curled Ring Ice Drop that I posted here was taken up in Online Tatting Class on Feb 18th along with Ninetta's original post/pattern. For 2nd motif (seen from back) wind thread ctm. Silver used here. What Ninetta did was curl the rings (immediately after closing each) through 1st motif, thus securing them in place and also forming a pocket to insert the gem. So while a 2nd motif was tatted, it was not 'separate', joining as we go. For this reason, only 2 rounds performed the function making it easy to stop at this stage; the 3rd round in her original pattern merely added decorative value. Many more stepwise pictures are posted in Ninetta's blog in the link provided above. Notice how the upper and lower motifs are completely separate, then placing them over each other, the silver is interlaced, and the gem inserted before interlacing the last ring. However, the silver rings are floppy and need another round of tatting to hold them together. Ninetta's curled rings engineered the feat without the need of another round as pointed above. We thank Georgia, again, for her interest in this beautiful design and for sharing it with the class. I only wish I could attend the same way as a year back. Over-enthusiastically, I would sometimes attend even the first session which starts at about 0030 hrs my time! No wonder it affected my health and constitution. I miss the motivating and learned company! This has been on my mind for a long time. I’ve shared pics of the Rosette Enchained medallion back in April 2017. It was designed specifically for the This Way or Tat? (TWoT) series (Set II). Then while re-tatting some of my snowflakes in Lizbeth 20, I worked this too. (it measures just over 4cms). Since then, an ice drop adaptation/version has been on my mind. With numerous distractions along the way, I finally completed it a couple of days back. Worked with one shuttle and ball, ctm. In Anchor Pearl size 8 (≡20), it measures about 5½ cms with the cab just short of 2cms. Only chains front and back. Back is worked separately from front, and then linked while working it’s last round. Hence the cabochon can be inserted at the very last stages with just a chain or 2 to go!!! In above collage, the close-ups are of the back. Once I have the ice drop worked in solid but light colours (going to use 2 colours in one of them for a 3D floral effect! ), I’ll share the pattern. Hopefully both patterns. I had experimented with entrapping the cabochon with chains only. There I used inverted tatting technique. This time it is simple chains and lock joins with some decorative picots thrown in and a change in chain direction for that inward curve of 'petals'. rose is a rose is a rose, whatever the material used. Time to make a rose spray after my first trial here. Huh, turned out the coloured paper I’d bought had lots of coloured square sheets but only 3 of each colour. And each rose requires 3 sheets to make. It was either send hubby back to buy more, or simply go with the white rose. Why not? The first one did look good. And the theme seemed to be white (white saree, silver/white wrapping paper). I found the video for DIY paper rose. It is by Dreamy Posy here. Leaves are simple, as before, except for a spikier rim. Folded for veins. A spray needs baby breaths! Watched this video by tsuku cafe and tried. Ugh, it was a horrendous job with glue & tissue sticking to my fingers. Not happy with the green taping either, but well, job done. (the 'well' is displaced ;-P). If we were geographically closer, I would’ve offered to make a better spray. I'm going to try my hand at crochet roses/flowers for next time. In crafting, nothing goes to waste! The ice drop here was a second attempt. The first attempt, too pretty to discard, is now a pendant! 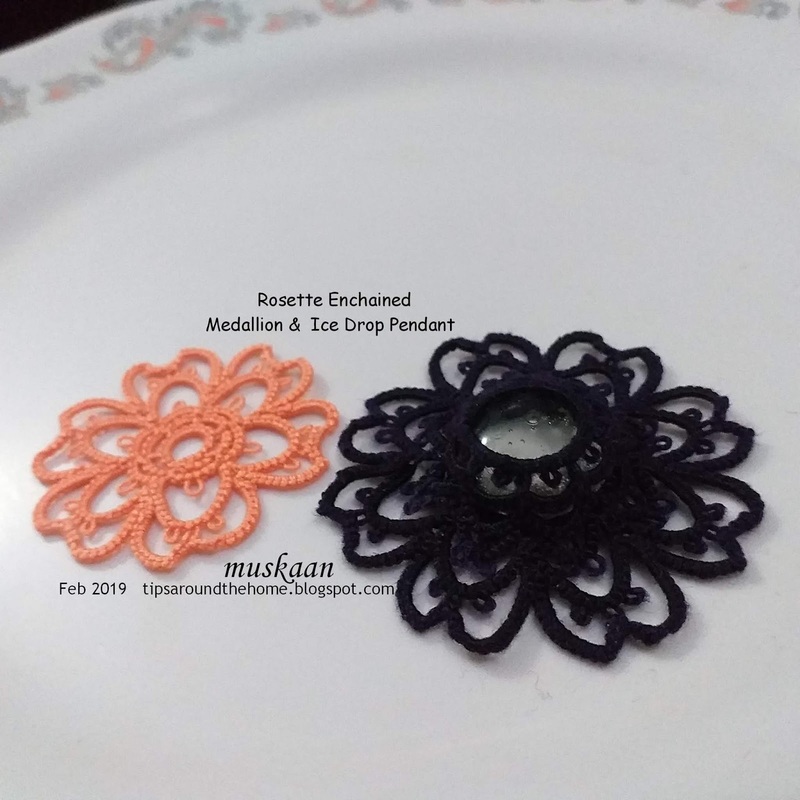 Download Jane McLellan’s Elana ice drop pattern from her blog (listed on right panel). 1. the perle cotton is not stiff enough it’s shape with the weight of the glass pebble unless stiffened later. 2. I forgot to link adjacent motifs (which is why you see 2 green beads between the motifs)! Clearly they would’ve started flopping even more as the round was completed. The threads had not been snipped off for want of a decision at the time. So I finished the left side (as seen in pic) with a chain of 10ds, secured it properly to previous round, then continued with a pearl string. On the right side, I pulled off a length of thread, inserted it through the base of split ring and repeated as above. Both pearl strings were tied off with relevant findings and thread ends needled back through the end beads before snipping off closely. I hand-sewed pearl & green seed beads on the top part of the pendant later. Obviously one can simply string the beads beforehand and tat regularly with beads in place of picots. This picture shows the overlapping motifs clearly. But with mere 4 repeats, this pendant does not require stiffening. The green glass pebble used here is 2cms in diameter. Anchor Pearl size 8 (≡ Lizbeth 20) white thread. Overcoming the lethargy to work with beads means I take the opportunity to work a few projects in quick succession! This time it is Ninetta’s ice drop with curled rings. Well, it does have another round with treble hearts, which changes the circle to a square. I stopped at 2 rounds since this appealed to me even more. The variegated didn’t quite turn out as pretty as I'd visualized. And as you can see, using it for the curled rings makes it look too busy. Went with silver (on right) and snipped off the earlier part. TIP : To get the curled ring to look like a heart, insert the ring (the picot end) from below and fold/curl from above. This difference is clearly visible between the first 2 curls on the left. As recommended, I chose a 2cms glass pebble. Yet for some reason it looked like 8 repeats would be too tight a fit, so a 9th was added. No, didn’t need it! I like the clever way she used 2 motifs to interlace and trap the cabochon within! Faux Celtic along with curled rings and more – nice!! You can see the underbelly in Ninetta’s post – I forgot to take a pic. UPDATE (Feb 25) : Please read continuing post with some more pics and a WIP variation. This pattern was taught in Online Tatting Class on Feb 18th. Remember how I couldn’t introduce you to Goldilocks since she was already in bed? The wait is over. Meet Goldilocks and her friend, Elana! Well, opposites attract again (see comments here)! Gold / silver; tiny / large; warm / cool; quick project / long project; AND our two friendly designers from different hemispheres! Goldilocks is actually Ninetta’s Valentine earrings shared here. Closing the spiral ring using metallic thread was a tad dicey. Anyway, after making it with single shuttle, I switched the shuttle thread to regular cotton size 20, using gold for the visible stitches. Lenka shared some nice pics on how to add beads in spiral rings. Do check out her beautiful applications of the spiral rings. Red Rose metallic gold size 20 & Anchor size 20. size 16 seed bead & crystal teardrop. 2+ cms across & 3+ cms long without teardrop. Jane McLellan’s Elana has long been on my to-tat list. It is such an elegant pattern. Notice the missing chain in first round? I used the double ring & chain sequence. And the rings on the back are 5-5-5. I used bead as picot gauge method to load bead with a crochet hook only when it was time to link. Yet the small Pony shuttle bobbin had to be loaded twice. Adjacent Ankars motifs are slightly tightly packed with some overlap – perhaps my seed bead was too large? By chance, but perfect timing! When I saw Elaine P Gan’s Rose Heart, I wondered whether 2 shades of yellow would work well here. This is my first project from any of her patterns, though as you know, I’ve been a frequent user of her reverse join! And, through Sue’s test tatting, I have admired how she puts together patterns using simple motifs and fairly basic tatting. Worked in Anchor size 40 (00293 & 00302), with ball and shuttle. No heart should be alone! I’ve been seeing lovely models of Gloria Nelson’s With All My Heart in facebook and liked it’s simple elegance. The outline appears like a free-flowing scroll! A clover is arguably the simplest heart shape in tatting. So why not highlight that with a contrasting colour? How to do it without too many ends to hide??? Aha. SCMR – self closing mock rings! And all worked with one shuttle only! Same as what I did with the very colourful scrappy doily! I wound yellow in the shuttle without cutting it from the ball. The magenta is ball only. Work all 3 clover rings as mock rings using yellow core thread from shuttle. Then snip off the magenta (with tail to whip stitch later) and continue the outer round using yellow ball thread. The thrown/floating ring at the bottom is also worked as a mock ring. Worked in Anchor Pearl size 8 (00291 – shuttle & ball ctm & 04380 ball). Both hearts measure approx. 4cmsx4cms (bit longer than wide) and are quick enjoyable tats. And I used Ninetta's blipless join again. I like the contrast of these designs - one frilly the other stark. Yet both so beautiful. Although I worked both as simple motifs for now, Gloria's pattern is for a beaded lanyard and Elaine has used hers on a card. In order to get a feel, I worked the first one in single colour (except for the dimpled heart motif). TIP : Leave some space between the dimpled heart and ring at it's base in order to accomodate 2 lock joins later. Also took a few in-process pics in case someone would like to reference later. Wondered whether a smooth outline would look good; so I decreased the count in the outermost chain and used Catherine Wheel join (cwj). Nope, I don't think it works! Having tatted many of Sharon’s patterns, I’ve come to realise that my chains (and tatting in general) are more taut than Sharon’s and I need to factor that in to avoid cupping. Now for the coloured spring impression. BUT I realised after completion that this short chain is not required IF one starts with the flower on the left!!! Work left flower, climb out to right flower, and then add green to continue working as per diagram. Work counterclockwise to complete the left foliage (2). Notice where the split chains and rings are. The lower SR that links to the heart is worked last, so as to continue along to the next round (3). Interestingly, I got to work split chains in both directions - left to right & right to left! Check out the tutorials here. Another change – omitted the little ring in the dimpled heart motif. I think this stands out much more as a tiny heart framed by the large one. In order to frame & highlight this spring-y impression, I added the beige for final outline. Can’t say how much is evident, but a couple of my split chains are incongruent making the overall heart a bit lopsided. So, Sharon & Jane – your thoughts ? Both are worked with size 40 threads and measure around 5cms X 6cms. blue – 00130 ; teal – 00528.
red – 00046 ; yellow – 00293 ; green – 00229 ; beige – 00368. Sharing 5-in-1 Buddy Hearts patterns !!! The pattern presentation would’ve been completed in November last year, if it weren’t for, well, life. Just so happy to be able to do it at least before Valentine’s Day! the original notated pic Anita sent me! The short version only has diagrams and is a single page printout. Since I had already posted my thoughts here, I invited Anita to write about her journey. Which is when I realised our diametrically opposite approaches to designing our respective hearts – reminds me of centrifugal v/s centripetal forces! See, where Anita goes from the out in, having drawn the heart first, I chose the decorative piece first and then drew an incomplete heart outline which was ‘completed’ with leftover motifs forming one side. Further, her hearts can be worked continuously, whereas my hearts are a combo of separate pieces – the floral spray and the heart proper, and worked in 2 thread sizes for better effect. Read about both approaches in the pdf. And oh, there is a bonus heart pattern in the bundle – 5 complete patterns for our tatting buddies, and one slight variation. though not indicated in diagram. Anita's bonus pattern - Daisy Heart ! Anchor size 40 (maroon) & Lizbeth size 20. And in Anita's words – “Think happy thoughts”. Connect with your buddy and spread new tatting hearts around !